If you have always wondered what kind of dessert you can make with Nutella, then this recipe is for you! It might not be the healthiest dessert recipe, but it sure does taste good, requires only a few ingredients, and is very simple to make. The great thing about this recipe is you can add just a little bit of the hazelnut spread or a lot, depending on your preferences. Preheat oven to 160 degrees Fahrenheit. Mix egg yolks, sugar, and vanilla extract until smooth. Add flour and stir slowly. Using a separate bowl, mix egg whites. Combine the ingredients in both bowls and mix well. Place mixture in a cake pan and heat in oven for 10 minutes or until it is golden in color. Once cooled, take it out of the pan and place on a plate or cutting board. Add Nutella and roll it. Add chocolate chips if you like. If you haven’t heard of Nutella, it is a creamy hazelnut spread. It is made from roasted hazelnuts, skim milk, and just a hint of cocoa. Parents love it because it is free of artificial colors and preservatives. It also does not have peanuts and does not come into contact with peanuts while it is being manufactured. This hazelnut spread is kosher and is gluten-free, too. The hazelnut spread was created in the 1940’s by Pietro Ferrero. At the time, cocoa was in short supply because of World War II rationing. In response to people wanting cocoa, the Italian pasta maker used hazelnuts to help extend the supply of chocolate. It was a brilliant idea and we are still enjoying his creation today! Another interesting tidbit is there is actually a day dedicated to the hazelnut spread. February 5 is World Nutella Day, so save this dessert recipe to celebrate! This delicious dessert recipe can be served with ice cream or tastes especially good while sipping coffee after a long day. You can also warm it in the microwave if it happens to be chilly outside. Both children and adults alike will love the taste of this dish. 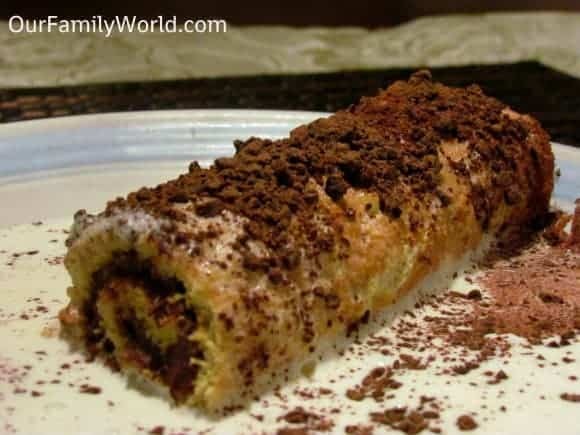 What are some of your favorite Nutella dessert recipes? A “cake pan”>not a sheet pan? And the cake gets a golden color in 10 minutes of cooking? And the egg whites mixed in and not gently folded in? AS ANYONE ACTUALLY EVER MADE THIS CAKE????? My god it doesn’t make sense at all!! Yes for a cake pan. You can use a sheet pan also. We love Nutella! This looks easy to make and delicious! This looks amazing! I’ve never tried Nutella and may have to try it out on this recipe! Your picture is divine. I wish I could eat Nutella! !